ST. GEORGE — Dixie needed a bounce-back game and Lehi was in the way. 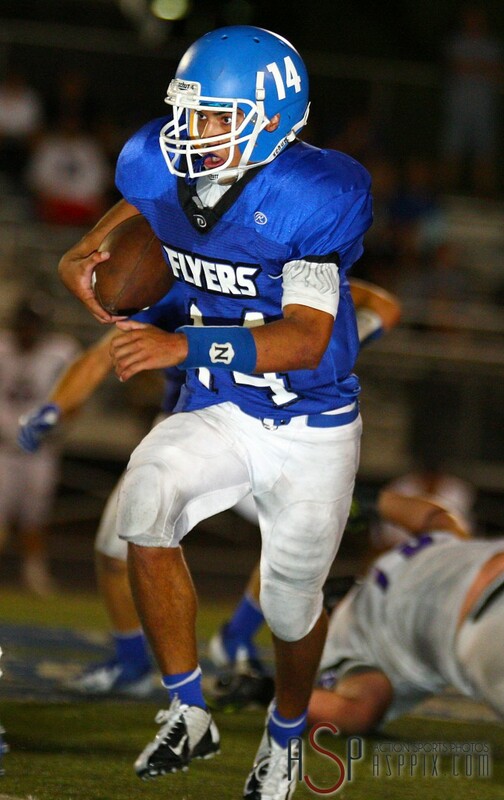 The Dixie Flyers rebounded from a tough loss last week against Springville and, behind 536 yards of total offense, throttled the 5A Lehi Pioneers 51-28 Friday night at Walt Brooks Stadium. The Flyers came out of the gates quickly, jumping to a 14- 0 lead in the first quarter and never trailed vs. the Pioneers. Dixie quarterback Ammon Takau, who last week shared reps at QB, was given full reign of the Flyer offense against Lehi. Takau did not disappoint. He found his receivers for 280 yards passing and four touchdowns and added 124 yards and a TD on the ground. Takau said a total team effort was the key to success against Lehi. In the second quarter, with the score 14-0, the Pioneers broke off a big play with a 51-yard bomb to Caden Calton that cut Dixie’s lead in half. The Flyers responded with a solid drive, finally getting in the end zone on a momentum capturing conversion on fourth and goal from the 7-yard line. Takau connected with Lukas Hildebrandt in the corner of the end zone to cap off the drive. Initially, the pass appeared too far out of bounds to reel in, but Hildebrandt skillfully dragged his feet inbounds and pulled in the pass for the TD. Hildebrandt finished the game with seven catches for 95 yards and two touchdowns. Dixie’s defense took the momentum into the third quarter and came up with a safety on LHS’s first drive of the second half to bust things wide open for the Flyers. Braxton Ipson, who racked up two tackles for loss, an interception and a safety, said he recognized Lehi’s play near the goal line from film study this week and jumped the play to stuff Pioneer RB Carlton in his own end zone. After Ipson’s safety, Dixie had a big return on the safety punt which set up Takau to break free and scamper 16 yards for a TD to turn things ugly at 30-7. Lehi fought to stay in it, but an 11-yard run by Drew Batchelor and another TD reception by Hildebrandt, this time from 14 yards out, extended Dixie’s lead to 44-14. After, it was all academic as Dixie cruised to its first victory of the 2013 campaign. Dixie dominated nearly every statistical category. The Flyers outperformed the Pioneers in total offense, first downs, time of possession and turnover efficiency, tallying 536 yards of total offense compared to Lehi’s 290. Dixie also moved the first down chains 27 times Friday night while LHS had only 16 first downs. 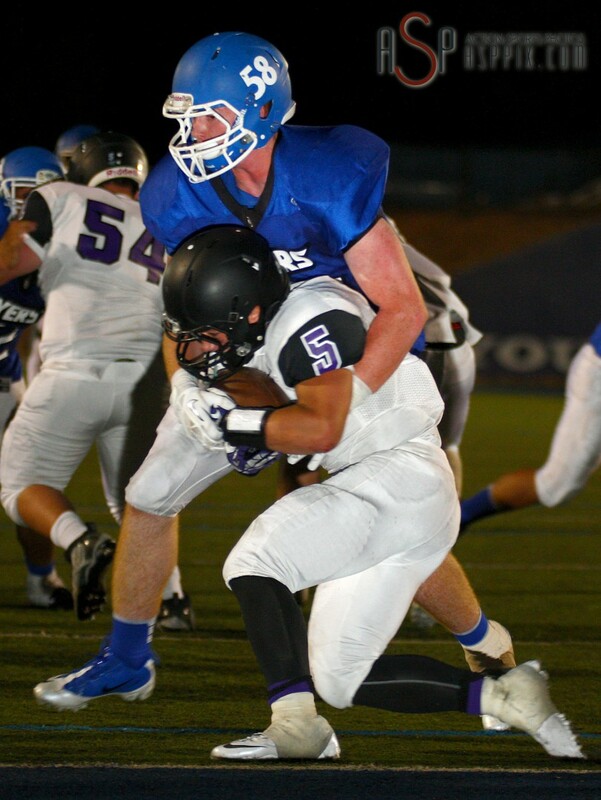 Dixie (1-1) faces another tough test as they take on another non-region 5A foe next Friday. The Flyers will travel to the Salt Lake Valley to take on undefeated Riverton (2-0).